TEA is asking for your help in ensuring that parents have the information they need to access their students’ STAAR results over the summer. Starting June 13th, when STAAR performance information becomes available, parents can immediately access their child’s results and a suite of other resources to support summer learning at home by visiting TexasAssessment.com. At this time your district will also receive paper copies of the STAAR Student Report Card (SRC) to distribute to parents over the summer. Distribute the linked flyer below to all parents in your district: Please use whatever methods you typically use to share information with parents (direct mail, email, sending home with students, etc.). This flyer is available in both English and Spanish and details the steps parents must take to Log In & Learn More about their child’s STAAR performance at TexasAssessment.com. We’d like you to share as soon as possible, but no later than June 13th. 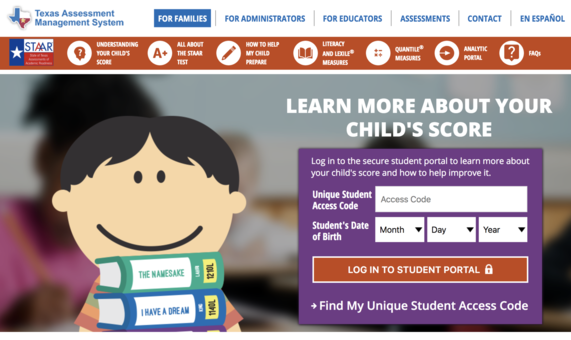 Securely distribute STAAR Access Codes to parents: STAAR Access Codes are needed for parents to login to TexasAssessment.com and are the same as the “Student Portal Unique Access Code”, which you can find in your district’s STAAR assessment data files. These are unique IDs and should not be sent home in backpacks—please use a secure method for distributing them. We’d like you to share as soon as possible, but no later than June 13th. Distribute the STAAR Student Report Card: When you receive the paper copies of the STAAR Report Card in June, distribute this to parents in the event they have not logged into the portal by that point. This can be via mail, parent email, portal, or any method you typically use to communicate with parents over the summer. To assist your district in this effort, we’ve attached two resources for you to share with principals: a sample letter mirroring this same information and an FAQ document providing additional context about this effort. Your partnership in this work is critical to our goal of strengthening parent engagement and parent-teacher partnerships. TexasAssessment.com provides even more customized resources than last year, including detailed summer reading lists and math tips tailored to each child’s individual performance on STAAR. Parents can also see the questions their child answered correctly and incorrectly and find more tips on how to help their child improve. We think this valuable resource is one all parents should have the opportunity to access, and we appreciate your help. Thank you for your continued support of Texas parents, teachers and students.